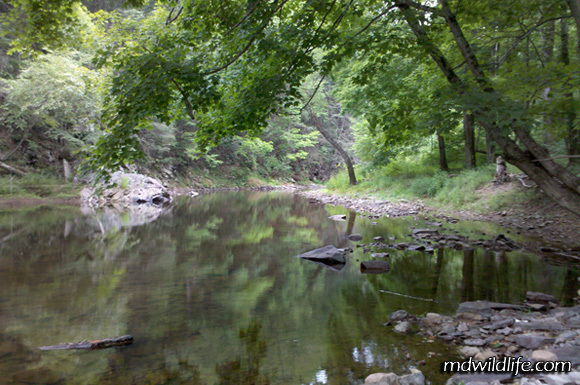 Looking down the stream that cuts through Sideling Hill WMA. Sideling Hill is a tucked away spot at the Maryland-West Virginia border, south of interstate 68 between the Green Ridge State Forest and the Chesapeake and Ohio Canal National Historic Park. The area is most easily accessed by taking Woodmont Road south from I-68. Woodmont Road will lead to a right turn on Pearre Road and that’s where the traveling gets interesting. Pearre coasts along the southern edge of the WMA for about two miles until the road forks. Stay to the right at the fork to take Alleghany Line Road, which turns quickly into a one lane dirt road snaking along a tributary from the North Branch Potomac River. The road is raised quite a distance above the small waterway, which is pretty much a stream, which supplies some nice scenery. The stream that runs through Sideling Hill provides a valley floor view toward West Virginia mountains. There is a small cut out along the dirt roadway that can fit a car or two and this path allows you to walk down into the stream. If you stay on Alleghany road you will eventually reach another fork. Once again, stay to the right and you will come to a small, marked parking area overlooking a vast meadow. Alleghany road continues a couple hundred more yards, but there is a wooded path directly in front of you that leads up Sideling Hill. And, boy, does it lead uphill. The walk can be somewhat challenging if the weather is hot, so make sure you have supplies to stay well hydrated. The walk is half a mile, straight up with a final elevation of around 1,300 feet. 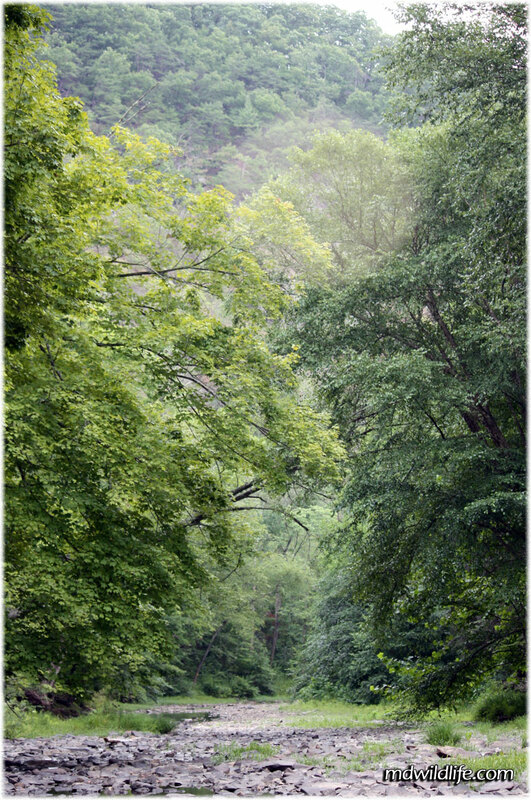 The trail is a single path surrounded by very tall woods with swaying and creaking trees. The feeling is old, empty and desolate. The path curves and continues to climb and you find yourself looking back continually and saying, “Wow – this is going to be a great view when I get to the top,” but there is no pay off. No money shot, no final view. When you reach the “top” of the hill, the path splits three ways. I took the straight path first, which went straight up the side of a short hill to give me a faux sense of triumph and no continuation to the actual top of the hill. I explored both the left and right trails for some time, thinking maybe at least one would lead to an overlook where I could see through a cut out in the tree line or even above them out to what I knew was a beautiful landscape, but no such luck. 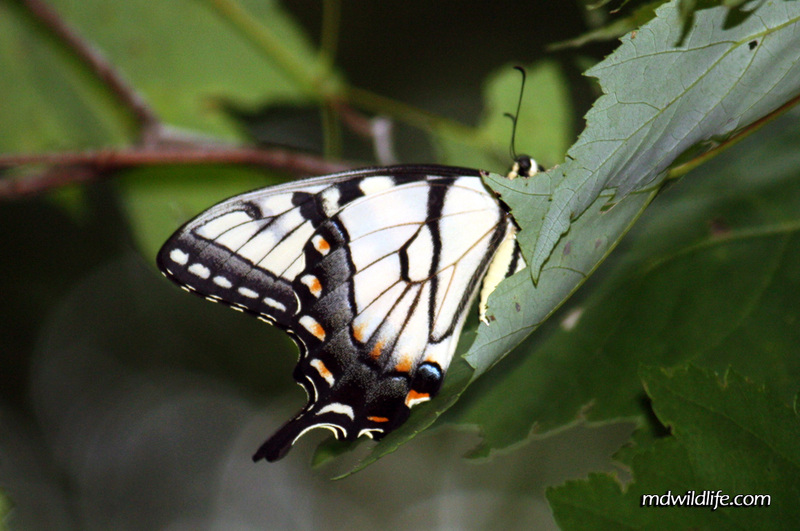 Eastern tiger swallowtail takes refuge on a tree leaf along the patth at Sideling Hill WMA. I didn’t follow either the left or right trail to its completion, because while studying my map as I walked and gauging the lack of change in elevation, I felt like neither option was doing a good job of bringing me back toward the parking area. As far as the wildlife itself goes, I did not see or hear too many birds on my trip up the hill in the middle of the summer, which was a surprise. There were several butterflies I caught along the way and random insects and spiders of course. Not too much in the way of small mammals either. On the drive back along Alleghany Road I stopped at the stream cut out and walked down to the water where I got some good shots. It was a nice area, very peaceful. I could see going back to Sideling. I want to try it during another season to see how different it looks.